Find yourself daydreaming about traveling the Spanish-speaking world? All set to a vivacious soundtrack of salsa, bachata, merengue and reggaeton? 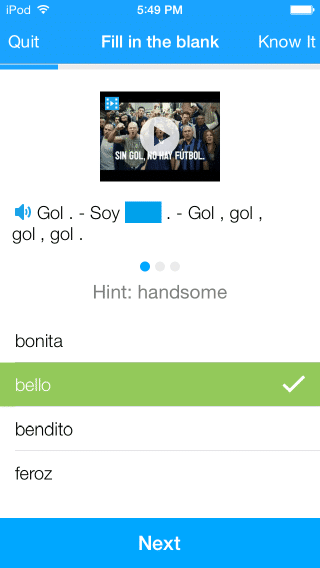 After a while, the typical methods of learning Spanish can become a bit dreadful. And the more boring and stagnant they become, it only makes studying well that much more difficult. Textbooks and classrooms are actually wonderful things when it comes to language learning, but you need to shake things up to keep the whole study routine fresh and engaging. So, before you get completely burnt out on trying to learn the Spanish language, know that there are countless other methods of learning the language if you set your mind to it. And some of these ways can be blended into your daily routine such that you feel like you’re not even putting forth any effort. One of these ways may almost sound too good to be true: download some songs in Spanish and add them to your playlist. If you ever get the chance to ask them, some of the cab drivers in South America will tell you that how they learned English was just by listening to English music—driving and listening, all day long. So, perhaps you should try the same. It takes very little effort to get started and find the music that works for you, and it can be a very effective way to learn a new language. Doing this, you’ll learn words, phrases and whole expressions with ease, improve your pronunciation and pick up proper grammar subliminally. If you’re not enjoying the musical lesson, don’t ever give up. You can always just change the song to something you love! And, no, the songs don’t all sound the same. If you’re one of those people who got your opinion of Spanish-language music from occasionally attending fiestas or eating at a particular tapas restaurant in your neighborhood, you may be thinking that it all sounds something like an accordion falling down stairs with the same lyrics being repeated over and over again. But trust me, there’s a huge diversity of music out there to explore. While each type of traditional Spanish music tends to use a similar rhythm or beat to accommodate its associated dance style, rest assured that there’s modern Spanish music that fits into a wide variety of genres, beats and styles. There’s rock, hip-hop, rap, heavy metal, pop, R&B, you name it. After all, Spanish is the primary language in at least 20 countries around the world. Keep scrolling down, because soon we’ll go through a variety of Spanish artists so that you can find the ones that you most enjoy and start learning the language in a whole new way. After you’ve listened to a few of the songs below, be sure to download your favorites onto your music player so you can have them when you’re on the go. Then, you’ll have learning material for when you’re driving to work, waiting in line, working out and all the other in-between time you find in your daily routine. The next step, after you’ve familiarized yourself with the words a bit, is to find out what all the lyrics mean. 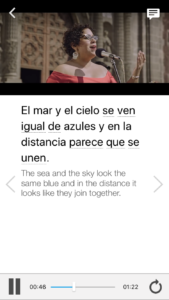 With a simple search in Song Lyrics or AZlyrics, you can find the lyrics, copy and paste them into Google Translate and have both versions side-by-side to compare. You could also opt for a lyrics site with a built-in translation, or you could go the extra mile and try translating the lyrics on your own. By doing this you can learn more about the practical usage of the language, gain some vocabulary and easily grasp the major differences in syntax between your native language and Spanish. This type of lyrics-oriented studying has many advantages. Rather than just going by the book and working with a resource someone else has recommended, you’ll make this experience far more personal. 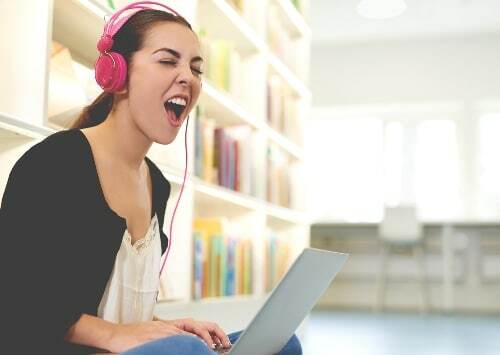 The songs you’ve chosen yourself will likely relate to you a lot more than what you’re reading in your textbook—since those books are meant to cater to a diverse audience—and having these Spanish melodies stuck in your head all day will help you boost your language skills without a doubt. 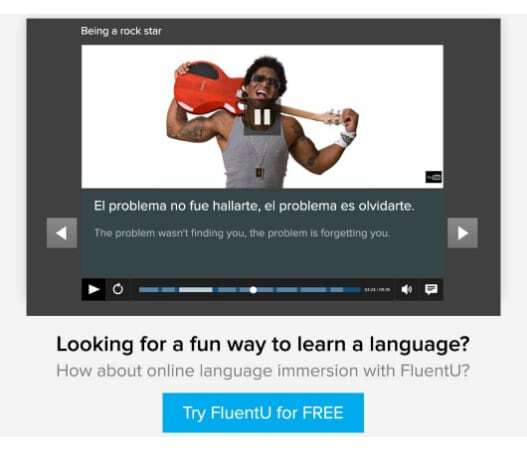 For a more complete walkthrough of how to learn Spanish with music, be sure to check out this guide. 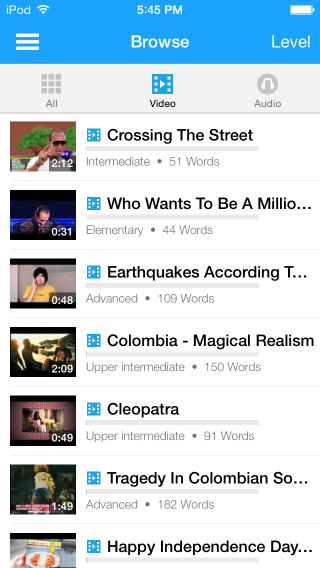 You can also get a more structured, guided learning experience from songs thanks to FluentU. So, let’s get started by checking out some of the best Spanish musical talent from around the world. Surely you already know about Shakira, Pitbull and Jennifer Lopez, but what else do you know about Spanish-language music? Start listening well now, because we’ve got a lot to listen to. Don Omar is a Puerto Rican singer and songwriter who has become an international icon with his pop and hip-hop songs. If you’re an avid club-goer, you’ve more than likely heard songs by him before or may have even heard one in a popular movie from recent years. One of his most catchy songs, “Danza Kuduro,” is on his collaborative album, “Don Omar Presents: Meet the Orphans,” which debuted in 2010. The single also features the French-Portuguese artist Lucenzo, so you’ll hear some Portuguese mixed in as well. The title of the song translates to “Kuduro Dance” in English, which is a type of dance that’s popular in Portugal. This song is unique because it features both the Spanish and Portuguese language throughout and is extremely catchy—seriously, you’ll never forget this one. If you like tropical music, you’ll love the mellow, sentimental tunes of Romeo Santos. The singer decided to start a solo act after nearly a decade with Aventura and took his music in a different direction. Producing a more tropical sound, his debut solo album, “Formula Vol. 1” was named the best Latin album of 2012. With the success of “Formula Vol. 1” came the subsequent “Formula Vol. 2,” and one of the top tracks on this one was “Eres Mía” (“You’re Mine”). With music as unique as his name, if you like trippy, indie stuff, this guy is for you. The Venezuelan songbird has become popular in many English and Spanish-speaking countries around the world. Devendra is usually known by his strange style, but one of his most famous Spanish songs, “Santa Maria Da Feira,” is lovely and mellow. With its catchy tune and simple vocabulary, this song is as easy to listen to as it is to follow. Surely, you’ve heard of these guys before. Their songs “Insane in the Membrane” and “How One Could Just Kill a Man” have blasted in the streets for decades. Cypress Hill is formed by two brothers who were born to American immigrants from Cuba. Since their debut album in 1989, they’ve continued to meet success in the music world with both Spanish and English fans alike. Cypress Hill has put out hip-hop songs entirely in English, entirely in Spanish and even some with a combination of both. The songs “Latin Lingo” and “Hand on the Pump,” featured on their multi-platinum debut album, have lyrics in both languages. Selena Quintanilla was a big deal—the biggest deal—back in the ’90s. Said to be Mexico’s equivalent of Madonna, she took the Spanish-speaking world by storm and gained immense acclaim in the United States and internationally. Being one of the first female singers to ever pursue creating Tejano music, a genre which was very male-centered in the ’90s, the singer broke boundaries and records. “Entre a Mi Mundo” (which translates to “Enter My World”) debuted in 1992 and was considered her breakthrough record. The single, “Como La Flor” (“Like The Flower”), is one of her most popular from the album—and from her career. Selena continued to produce popular songs all throughout the ’90s and won countless awards (including a Grammy for the best Mexican/American album) until her untimely death in 1995. Her songs are not only pleasant to listen to, but great learning materials because they’re simple and easy to follow. This song has recently become the #1 most downloaded Spanish song on iTunes, so if you’re one of those who aren’t too picky and just listens to whatever is the most popular, maybe this is a good strategy for you to find new Spanish music you’ll like. Enrique Iglesias is another Spanish artist who is famous with both English and Spanish speakers alike. In some of his earlier songs, you’re likely to hear a mix of both languages. “El Perdón,” which translates to “The Forgiveness” in Spanish, is fairly easy to follow and contains many different verb conjugations to study. Since Spanish is the native tongue of at least 400 million people worldwide, of course there’s a large audience to please. 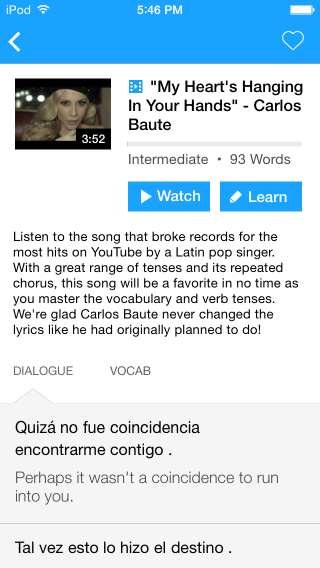 Many songs that are popular in English also have been covered in Spanish. While their original music is worth checking out as well, their cover of “Hotel California” in Spanish is definitely something to add to your Spanish playlist. So there you have it. These are just a few of the countless talented Spanish artists from around the world. So get to listening. 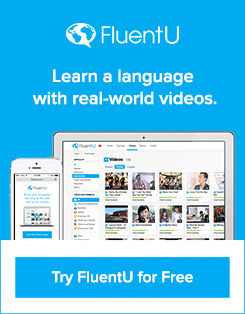 You’ll boost your natural language skills and improve your memorization and pronunciation in no time. There’s surely some Spanish music out there for you to enjoy, learn from and maybe even dance to!